“Hurricanes of the Gulf of Mexico,” by Barry Keim and Robert Muller – This book is a dry one, but if you want a history of a lot of storms that have worked their way through the Gulf, it delivers. Again, it won’t win any awards for being a fun read, but it’s a nice reference to have and may give you storms to research and learn more about. “Thirty Eight,” by Stephen Long – This book has nothing to do with Texas or the Gulf, so why am I recommending it? I read fewer weather books than you’d expect. Much of my time and focus with reading is spent on American history. So when I do read a book about weather or a storm, I have a high standard. This book absolutely blew it away for me. It tells the story of the great 1938 New England hurricane (the “Long Island Express”) in a non-traditional way: Through the trees and forests of New England. One of the more unique books I’ve ever read. It discusses how you can still see scars from that storm today, and it gave me an interesting lesson in trees. It’s fascinating. Note: “Taken by Storm,” by Lourdes Aviles is another good read for more about the meteorology behind the 1938 hurricane, one that would be catastrophic if it repeated itself today. “Flash Floods in Texas,” by Jonathan Burnett – Full disclosure: I *just* ordered this book so I haven’t read it quite yet. But it’s easy to see from previewing it that this will be a wonderful resource to have, and I wouldn’t hesitate recommending it right away. This book is what it sounds like: A history of flash flood events in Texas.This won’t cover every flood event we’ve seen, but it does cover some of the worst, underscoring how widespread a threat flooding is in our state. Locally, there are chapters dedicated to Allison and the December 1935 downtown Houston flood. 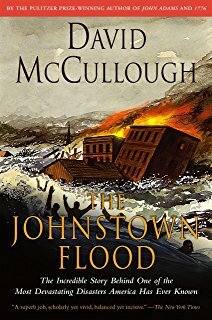 “The Johnstown Flood,” by David McCullough – McCullough is one of the best non-fiction writers in America, and this book was his first. It’s one of those “essential” books about a weather event to have on your list. The story of Johnstown is a tragic one. This book does a good job keeping the story alive. “What Stands in a Storm,” by Kim Cross – A book that tells the story of the April 2011 Southeast tornado outbreak. This book is not easy to get through without becoming emotional. It’s a very easy read, but also a very tough topic. The story of the event is told, interweaving the lives of people from Mississippi and Alabama into how the outbreak unfolded. It’s really, really well done, but prepare to wipe your eyes. “Essentials of Meteorology,” by C. Donald Ahrens – Unlike the other books on this list, this one is actually a textbook. But don’t let that scare you. If you actually want to understand the nuts and bolts of the atmosphere or have an interest in pursuing a meteorology degree, this book absolutely gives you a great introduction to the basics. To read and learn from or to just have as a bookshelf reference, I highly recommend it. It was my first college meteorology textbook, and I found it extremely accessible. “Northeast Snowstorms,” by Paul Kocin and Louis Uccellini – Being a New Jersey native I had to include this one. This is a heavy two-book set, both literally and figuratively. But if you are really, really into meteorology and like winter, you have to have this. Many case studies walk you through various winter storms that have impacted the Northeast Corridor. If you seek a deeper understanding of winter storms in general, this is an invaluable resource. As a meteorologist and weather weenie, I have to say it’s just awesome. By no means is this list exhaustive. These are just books I own or that I have read. I have dozens of other books on my list that have something to do with weather. One day I’ll get to them, and I’ll publish an addendum to this post. I’ve read both Larson’s and McCullough’s books. Both are engrossing page turners. 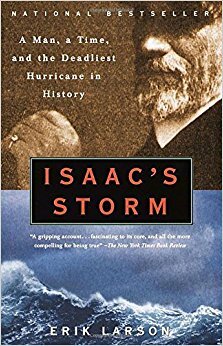 Isaac’s Storm in particular is the type of book you actually remember reading and remember the emotions it brought while reading it. And of course I failed to look at the byline. 🙁 Sorry Matt, thanks for the list. I thoroughly enjoyed “Isaac’s Storm” the year I moved to Houston. Now I’m looking for education and facts about what’s alluded to in the Wednesday Chronicle article on flood pools. Apparently, the flood pools are known flooding risk areas, that are outside of the 100-year floodplain. See Houston Chronicle September 27, 2017 “Army Corps should have bought easements to make room for flood pools, lawsuit says”. Is there a map of flood pools? 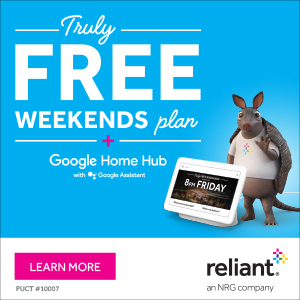 Is there a list of subdivisions with houses within the flood pools? Apparently, there’s a cross-disciplinary (weather, hydrology, hypsography) subject that are I’d like more facts and analysis than the paper can provide. The article sites County and City Commissioners being afraid (of lawsuits) to turn down permit requests by builders as a reason to grant housing building permits. Shouldn’t they be more fearful of flooded residents and class action suits against them for getting flooded in known flood risk areas after IGNORANTLY buying homes in those areas? By willful planning or head-in-the-sand aren’t we planning to put residents in harms way? My wife printed off a map from the USGS Web site titled “Barker Reservoir”. There is shading that clearly show the areal extent of the maximum flood pool. I would imagine there is also one for Addicks. Hey — what about a mention for THE book on Hurricane Ike?! Thanks for sharing this! I had not seen this one before, but I have now added it to my list of books to read! Interesting list. I just ordered Thirty Eight through your Amazon link. Do you get commission on the referrals? I know it’s not much but I have no problem ordering books through links, especially if it helps fund your site in some small way. Are there any good weather books for kids? Great question! I’d like to know, too. Eric Sloane’s Weather Book. My grandparents gave me a copy when I was a boy & I looked at it all the time. Great hand drawn illustrations. I think it’s available through Dover books. Kids books are more difficult for me (not being a parent yet! ), but I suppose it depends on age. Janice Dean’s “Freddy the Frogcaster” series is widely praised by a lot of folks I know. https://www.amazon.com/dp/B00EGWEXM4/ref=dp-kindle-redirect?_encoding=UTF8&btkr=1 It’s probably geared toward younger kids (but not “Cloudy with a Chance of Meatballs” age). I’m sure there are some others our readers can recommend. Dark Water Rising by Marian Hale is a middle grades novel about the 1900 Storm—if you can get past an unlikely ending, it’s a good read based on good research. Shout out for “The Signal and the Noise” by Nate Silver. It’s technically not a book about weather. It’s actually about predictions and forecasting of all types (sports, politics, etc). However, there is a lengthy (and highly fascinating) section dedicated to weather forecasting. A must read, in my humble opinion, if you are interested in statistics and probability as they relate to weather. Matt, thanks for sharing all your reccomendations. Would you post a link to your 2 tweets about the books on your reading list post Harvey, Irma, Maria…..hope we don’t have to start the alphabet over before this season ends!!! They are “The Thousand Year Flood,” by David Welky about the 1937 Ohio/Mississippi River flood, “Heat Wave,” by Eric Klineberg about the 1995 Chicago heat wave, “Eruption,” by Steve Olson about Mt. St. Helens, “A Watershed Year,” edited by Cornelia Mutel about the 2008 floods in Iowa, “The Great Quake,” by Henry Fountain about the great Alaska quake of 1964, “The Unthinkable,” by Amanda Ripley about people that survive disasters, “Red River Rising,” by Ashley Shelby about the 1997 Grand Forks, ND flood, and “Rising Tide,” by John Barry about the 1927 Mississippi River flood (which has been recommended by multiple readers here!). I am no expert on weather or predictions. I consider myself a person that like to learn about everything. When in college I took a meteorology class, I could choose between two professors, one I could get an easy A the other his class was hard to fill. I choossed the second one. Wow, it was one of the hardest and fun classes ever. Every morning we have to look at the cloud patterns, name the clouds with their proper name and predict when was supposed to rain. Living in Island the predictions were very accurate, what a great teacher. Thanks for the book suggestions more for my learning. This book is on my short list of weather books also! I’ll second Bob Davis’ recommendation, The Children’s Blizzard!! I grew up on the MN/WI Mississippi River border and remember some wicked winter blizzards however nothing like this January 1888 storm. I highly recommend Willie Drye’s “Storm of the Century,”‘about the 1935 Keys hurricane. This is the book that “got me started” and I often wonder why it hasn’t been updated and reissued since 1995, seems to me there would be an audience for it. The Johnstown Flood was very good. A couple of months after reading the book I had a company trip to Pittsburgh and found the time to make the drive to Johnstown. Visited the graveyard where they have numerous crosses commemorating those who perished.